The palace took 3000 artisans about 15 years to carve from red sandstone. It’s an architectural mix of Rajput and art deco styles and feels right out of the pages of 1001 Nights. The palace was commissioned by Maharaja Umaid Singh, grandfather of the present Maharaja of Jodhpur, to create jobs for his famine stricken subjects. After 15 year in construction, the 347-room palace was finally completed in Maharaja Umaid Singh, grandfather of the present Maharaja of Jodhpur, to create jobs for his famine stricken subjects. After 15 year in construction, the 347-room palace was finally completed in 1943 and has served as the principal residence of the Jodhpur royal family since. 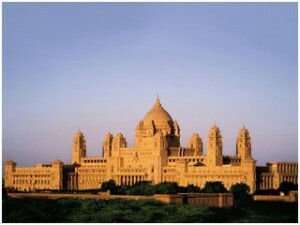 It is one of the world’s largest private residence, and Taj Hotels runs part of it for visitors. Check out the amazing gardens and the exotic murals of the self-exiled Polish artist Stefan Norbli, as well as a great mix of eastern and western architecture. 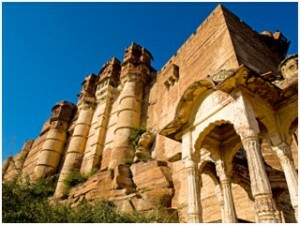 Ascend the rocky ridges above Jodhpur to the impressive Mehrangarh Fort, which has been finely carved out of sandstone and bears the marks of many battles. 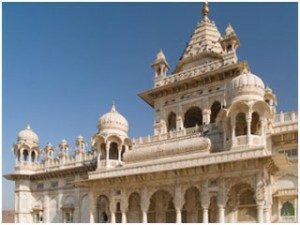 Its thick walls hold many palaces and it is still run by the maharaja of Jodhpur. It is a captivating place to visit and since it’s sprawled across a 125m-high hill, so as you approach you will see the amazing feat of the construction of its high walls. Jaswant Thanda is a welcome, peaceful spot after the hubbub of the city. It’s a 19th century royal tomb, and an example of the architectural brilliance in India. It is a white marble memorial, built out of intricately carved sheets of marble. The carving shows the genius of the sculptors. These stones are extremely thin and polished. As a result, the outside surface of the monument emits a warm glow when the sunrays fall on its surface.